A jigsaw is a tool that is used by woodworkers on a daily basis. It is a great way to cut a curved line in the wood, but it can also be used to cut a straight line or a beveled edge. It is also not only a tool for woodworking; most jigsaws can cut other materials like plastic and metal. Jigsaws of today have come a long way from the original sewing machine model that was created in 1947 and simply replaced the needle with a blade. Today, they feature lightweight, compact designs that have the power to cut through most materials, but with so many options available, finding a new jigsaw can be overwhelming. To make your selection process easier, we have put together this guide that includes a few jigsaw reviews that you should consider. Dewalt has been a leading manufacturer of quality hand tools and power tools since 1924. 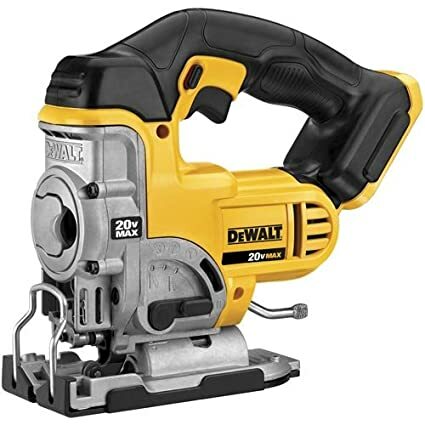 They are a company that is loved across the globe by critics and consumers alike, so it comes as no surprise that the Dewalt DCS331B was chosen to be our gold pick on this list. It is a classically designed yellow and black Dewalt tool that is 11.2 inches long, 11 inches wide, and 3.9 inches deep. It only weighs 6.8 pounds, so it is a tool that is easy to maneuver. It also is designed with a curved ergonomic handle that makes it easier to handle holding the device for long periods of time. The handle is padded with an anti-slip rubber material to ensure that you keep a good grip on the tool. This jigsaw features a cordless design that is easy to use in any location, but that means that you need to worry about battery power. The saw requires a 20 volt lithium ion battery to maintain power. You will find a 3.0 Ah battery and charger included in the packaging when you purchase this device. One feature on this jigsaw that is great for knowing where your battery’s life stands is the battery indicator light that is displayed on the body of the saw. The DCS331B is designed with a keyless blade change functionality that makes refreshing your blade a simple process. Only T shaped shank blades work in this jigsaw. In addition, the device functions with an orbital action that is capable of sawing from four positions. Insofar as speed, the power on this jigsaw can be adjusted to go anywhere between zero and 3,000 strokes per minute, so you have complete control over how fast and accurate your cuts will be. The metal shoe bevel on this power tool is designed with detents at zero degrees, 15 degrees, 30 degrees, and 45 degrees to make cutting a perfect beveled edge an easy task to accomplish. When the saw dust and the metal shavings around the blade get to be too much, there is a dust blower on this saw that you can adjust to remove the debris. A plastic carry case is included with the purchase of this jigsaw, which will be a great way to help you keep all of the components in one location. Dewalt has also included a three year warrant with your purchase. Bosch has been leading power tool technology since they entered the market decades ago. Today, they are more dedicated than ever at manufacturing durable innovative tools that will be used for years to come. They have become a reliable company that you can depend of for quality products, with that type of commitment, you will easily see why their JS470E came in as our silver pick. This powerful tool measures 15.7 inches in length, 14.3 inches in width, and 4.6 inches in depth, which is a good size for a power tool. In addition, it only weighs about 6 pounds, which is almost a full pound lighter than our gold pick. The unit runs on 7.0 amps of power, which is the equivalent of 120 volts if the unit used batteries instead of electrical power. There are four orbital action settings available to use to give you a wide range of blade strokes that can be adjusted to better accommodate your needs. This jigsaw is only designed to use T-shaped shank blades, so not all blade options will fit into the unit. When it comes to the time that the blade needs to be changed, the process is completed without tools and it’s simple and easy to quickly release the old blade and swap in a new one. This method guarantees that you never need to touch a hot saw blade again. In addition, there is a bevel wrench located directly o the unit that can be used to make a beveled edge that is up to 45 degrees, and if the dust becomes too much to handle, you can use the adjustable dust blower to remedy the situation. This Bosch jigsaw has a pretty wide range when it comes to speed. It can be set anywhere from 500 strokes per minute to 3,100 strokes per minute. There is a variable speed dial at the rear of the unit that allows you to adjust the speed to your liking. Some other features that may interest you are the anti splinter insert, the molded case that comes with the purchase, and the storage compartment where you can store your blades. The handle of this jigsaw features an ergonomic design that is easy on your hands, whether you are left handed or right handed. Bosch has also included a one year warranty with the purchase of this saw to cover any incidental costs that occur in the first 12 months. 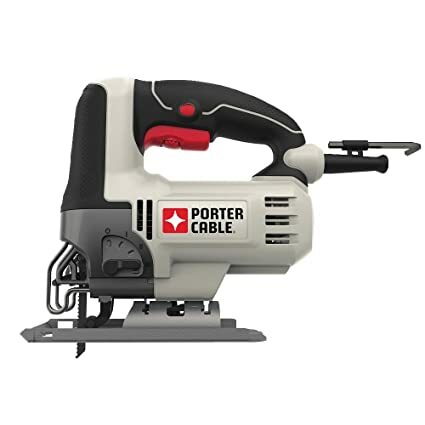 Porter-Cable is a company that has been heading the production of power tools since the early 1900s; in fact, the company opened its doors in 1906. With such a long history of tried and true products, it is no surprise that we would pick their PCE345 jigsaw as our bronze pick. It is a bit more compact than our first two options, coming in at 9.5 inches long, 8.5 inches wide, and 3.2 inches in depth. In addition, it only weighs 5.4 pounds, which makes it easier to maneuver when you are cutting through tough material. The handle features an ergonomic design that is slip proof, which makes it easy to get a good grip and maintain it. The jigsaw features a six amp motor that is powerful enough to get through most jobs. It has four orbital settings that allow you to decide the amount of cutting power you need; in addition, there is also a control that lets you adjust the speed to up to seven different positions. The dial can be set to run between zero strokes per minute up to 3,200 strokes each minute. There is also a lock on button that can be used to give you more control and accuracy as you make your cuts. The PCE345 is a unit that is capable of creating a beveled edge for those more intricate jobs. The edge can be cut at a zero degree angle, a 15 degree angle, a 30 degree angle, or a 45 degree angle, so you have plenty of options if you desire a beveled edge. To make it easier to see the line that you are cutting on, there is a LED light on this device that will greatly improve your visibility in low light situations. When you purchase this jigsaw, a three year warranty will be included from the manufacturer. Black and Decker is a company that has been known for creating quality tools at an affordable price for over a century. The company originated in 1910, and today, there is at least one Black and Decker tool or appliance in every home across the nation. If you are looking for a new jigsaw, but you are ballin’ on a budget, then our final pick, which is the BDEJS300C, is the perfect power tool for you. It is a small and compact tool that is only 11.5 inches long, 9.2 inches wide, and 3.4 inches deep. It also has a compact handle design that is easy to use. In addition, this traditional orange and black power tool only weighs 4.5 pounds, so it is easy to use on any job. When it comes to power, this little jigsaw has plenty to go around. It has a 4.5 amp motor that can power the blade to speeds of up to 3,000 strokes each minute. This device is designed to accommodate both T-shaped shank blades as well as U-shaped shank blades, which is a unique feature that our other picks did not have. The base of the unit tilts to several different angles to create a beveled edge of up to 45 degrees. Some of the other features that may interest you are adjustable shoe that gives you additional stability while the saw is in use as well as the wire guard sight line that is designed to improve your visibility as you cut. In addition, this tool features an ability to reduce the amount of vibrations you feel when you use the saw, and it also has a dust blower to clear the debris away from the line on which you are cutting. 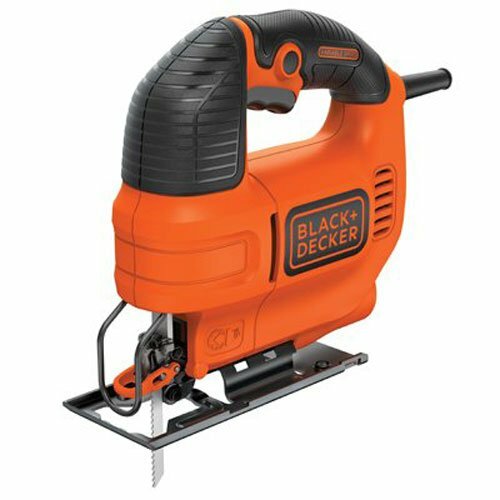 Black and Decker has included a generous three year warranty with the purchase of this jigsaw, so if any unforeseen issues occur with the tool, the company will cover the cost of parts and repairs. The first consideration that you need to make with most power tools that you consider purchasing is whether you want a corded or a cordless variety. Both have their advantages and disadvantages, but which option is more practical for your needs. 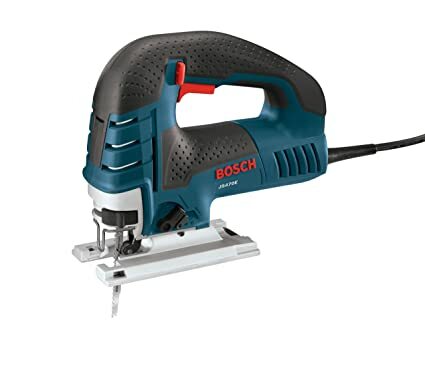 A jigsaw that is plugged in will have more power and be able to easily cut through dense materials, but a cordless version will allow you more mobility and the ability to use the saw on your deck away from a power outlet. Don’t forget that the batteries in a cordless model will not run forever, and if you cut a lot of hard wood or other tough materials, then the battery power may run low much more quickly. When you talk about the power level of a jigsaw, you are talking about the motor. Electric and battery powered jigsaws have two different ways of determining the motor’s speed. For an electric variation, you should look for a power range between four and seven amps. A battery powered jigsaw should operate between 18 and 20 volts of power. The more power the motor can muster, the faster the job will be completed. The speed of a jigsaw is calculated with strokes per minute (SPM) instead of with rotations, which is done this way because of the motion the blade makes as it is cutting. Most models that are available for purchase have a maximum speed of 3,000 SPM, which is more than enough power to cut through almost any surface. Some models even include speed settings that allow you to adjust the sped that the jigsaw is cutting at. This gives you the ability to decide how much speed and power is needed for each project, and thusly increasing the precision of your cuts. Another important consideration that you will need to make before purchasing a jigsaw is the blade that you want. Blades are typically classified by the number of teeth that each one has, so a blade with a lot of teeth will cut through a sheet of metal much faster than one with fewer teeth. In addition, the cut will be much smoother when the blade has more teeth per inch. Some of the more common saw blades that are used in a jigsaw are a hi-speed steel blade, a bi-metallic blade, and a cobalt steel blade. All of these options can be used to cut through wood and metal, but the cobalt steel blade is the strongest of the three, so it can cut through thicker metal than the other two options. The blade of your saw can move in two ways; using a pendulum action or an orbital action. A pendulum action moves the blade up and down. It cuts into the wood on the downward stroke and moves out of the wood on the upward stroke, so it is great for detailed work that requires precision. This method is a great way to keep the blades sharper longer. An orbital type of action moves the blade the same way as the previous, but it also moves side to side to make the saw cut even faster. Unfortunately, this type of fast cutting action makes a slightly rougher cut then a pendulum type cut. Just like with any saw, a jigsaw can be a dangerous tool to use if it is used incorrectly. To help prevent accidents from occurring, look for a saw that has a safety lock that will keep the saw blade from moving when you do not want it to move. Also, make sure to purchase a jigsaw that has a blade guard to protect your fingers. Another safety feature that you may wish to consider is a soft start; this feature is designed to start each cut off at a slower speed to make sure that you have a handle on the tool. Safety should always be a top priority when working with power saws, so make sure that it is your priority as well. • A dust blower is a great feature to have when you are cutting a lot of material. Jigsaws do not typically produce a lot of dust, but it still makes enough to hinder your view of the line that you are trying to cut on. • A LED light is a great feature to have if you tend to work in an area that has poor light. It will shine a bright light directly on the blade to illuminate your path. • A laser guide is great for making precise cuts that you want to ensure are cut accurately. With this feature, the laser shines on the line that you are cutting. • An area for blade storage is another consideration that you may want to make. If you are using the jigsaw away from home, you need a place to store your blades for transport. A lot of jigsaws have storage areas on the side of the unit. A jigsaw is a powerful tool that should be a part of any tool arsenal, especially if you dabble in woodworking or other professions or hobbies that can benefit from a good, strong saw. No matter what type of cut you need, a jigsaw can handle it. In fact, it is the only saw that is capable of performing a plunge cut, which is a cut in the middle of the material that you are cutting that is made without a pre-cut hole. Hopefully this guide has helped you determine which jigsaw is best for you. If our picks are not suited for your needs, use our pre-purchase considerations to help you find a jigsaw that perfectly fits your needs.